Dukkah was one of the things that started my love affair with Middle Eastern food. It may seem a lot to ask from a simple blend of sesame seeds, cumin, coriander and hazelnuts. But from the first time I tried this delicious and versatile Egyptian specialty I was hooked. My first encounter with dukkah was in McLaren Vale, South Australia, a picturesque wine growing area known for it’s gutsy reds.Â At the time an enterprising olive oil and almond farmer had started producing an almond based dukkah that was sampled along with their extra virgin oil in various wineries in the region. We were encouraged to try it the Egyptian way: take some crusty bread dip in oil and then in the dukkah…yum. According to Claudia Roden dukkah with olive oil and bread is eaten in Egypt for breakfast, lunch & dinner. And I’ve found that it has crept into my kitchen on all three eating occasions. For breakfast it adds a new dimension to honey on crumpets, for lunch it jazzes up sardines on toast and for dinner it lends a crunchy topping to a pretty pink beetroot soup. I prefer to make a largish batch of dukkah and then keep half in an airtight jar in the fridge and the rest in a plastic bag in the freezer.Â When my fridge supply runs out I just top up from the freezer.Â It will keep perfectly well at room temperature but the cooler your storage environment, the fresher it will keep for longer. This version was adapted from Claudia Roden’s eneyclopaedic tomb: a new book of Middle Eastern food.Â I’ve added macadamias to give it more of an Australian feel..and because I didn’t have enough hazelnuts..I was also a bit lazy and used pre ground spices but it would be even tastier if you took the time to first toast then grind whole spices..
Toast seeds and nuts separately until golden. Process hazelnuts and macadamias in a food processor until coarsley ground, add remaining ingredients and whizz until combined. Season well with s&p..I used at least 1t sea salt. Serve on a platter with oil and bread. To eat dip bread first the oil and the dukkah. 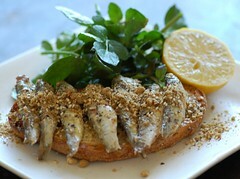 This is a new simple twist on an alltime favourite lunch: sardines on toast. I often serve toasted pinenuts with sardines, but the nutty spiciness of dukkah makes an even better accompaniment to the wee oily fish. Combine lemon juice, oil and mustard in a small bowl.Â Rub hot toast with the clove of garlic and place on a dinner plate. Top toast with sardines and drizzle with 3/4 of the lemon juice mix. Toss watercress in remaining dressing and place on the plate next to the toast.Â Sprinkle toast with dukkah to taste and serve with a lemon half. Adapted from a beetroot soup recipe by Jane Hahn from the July 2002 issue of Australian Gourmet Traveller. Interestingly, after I made my soup I noticed that Jane also has a recipe for a pumpkin carrot and saffron soup that was served with turkish bread and dukkah. Place beets on a large sheet of aluminium foil. Drizze with 1T oil, balsamic vinegar and season. Wrap foil to form a parcel around the beets and seal tightly. Bake for 30-40mins at 200C or until beets are cooked through. Heat remaining oil in a large saucepan and add onion. Cook over a low heat for approx 10mins or until onion is soft. Add stock and cooked beets and simmer for 15mins or until beets are very soft.Â Puree soup with a stick blender or transfer to a food processor and puree until smooth.Â Return to the saucepan and season and reheat. Serve soup in bowls topped with a dollup of yoghurt and a generous sprinkling of dukkah. I just came across your blog, I’m enjoying your posts and your beautiful photos. I think you’re doing an exceptional job ! 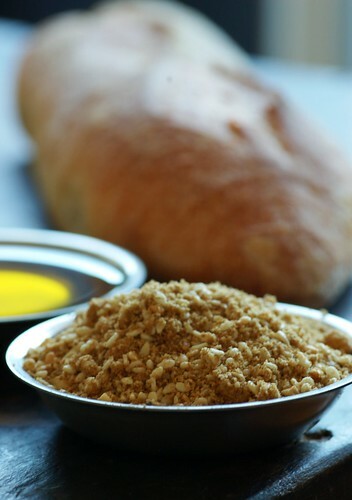 I share your love of middle eastern food and will definetely be trying out Dukkah soon with some good olive oil and bread. Perfect timing! My husband pulled a jar of dukkah off the shelf last night in Woolies and asked me what it was, I told him about the bread and olive oil combo, he was hooked on the idea and wanted to buy it straight away, as the jar was so small I responded with ‘I would rather try making my own’. So you have saved me having to search around for a recipe, thanks. And thanks for the tip about freezing it. I love Dukkah – sounds like a good recipe with maccas. Another thing I use it for is pressing on to a frenched lamb rack and roasting it. Our dukkah is made with whatever nuts we have in the cupboard crushed in the mortar as this releases the oils better and gives a different texture from using the processor. This usually means walnuts, cashews, macadamias and almonds, occasionally there will be pine nuts but they aren’t really needed unless there are no macas or cashews. Equal quantity of nuts to the spices (equal quatities of: ground cumin, ground cinnamon, ground corriander with a pinch of ground clove (if I have time I grind all this in the mortar before doing the nuts), some red paprika for colour (all depends on what nuts are in it), equal quantity of sesame seeds, all spread on a baking tray and toasted in a hot oven for a few minutes. The secret to yummy dukkah on bread is the balsamic, oil, honey, dipping sauce: equal quantities of balsamic vinegar and honey are heated on the stove and simmered till reduced to half (dont breathe in the fumes;-), remove from heat and add an equal quantity of good olive or macadamia oil, stir well or transfer to a jar and shake till well homogenised. The dukkah and dipping sauce will keep in airtight containers in the fridge for up to a couple of weeks. I found your website after making dukkah and love your macadamia version. I am HOOKED on this delicious mixture and will make another batch based on your delicious sounding recipe! I love your other recommended uses for dukkah as well. Thanks for the great information! i am of middle eastern descent and my mum used to combine dukkha with oil and spread it over pita bread and grill till crsip, and then serve with arabic haloumi and chopped tomato. Awesome breakfast or lunch. has been a dinner or two as well. i think i will try your soup though. yum! 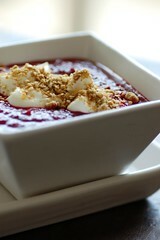 Love the sound of the beet soup with yogurt and dukkah! This is a lovely North African recipe. I love your blog and the fact that a lot of Middle Eastern recipes come up. I have lived in Egypt for some time now, travelled and eaten a lot, but this type of dukka is not used in Egyptian cuisine hardly ever any more. It is used much more often in other North African countries. Also, olive oil and crusty bread is hardly ever eaten in Egypt nowadays. Egyptian bread is usually flat and soft and olive oil is used to garnish dips but hardly ever a dip for bread itself. I wish I could eat crusty bread with olive oil, your dukka and crusty bread for breakfast, lunch and dinner. But I have never seen or heard of people eating dukka in present day Egypt in this manner. I am sure it happens but not in a widespread or well known. Just wanted to let you know. This is a lovely North African recipe. I love your blog and the fact that a lot of Middle Eastern recipes come up. I have lived in Egypt for some time now, travelled and eaten a lot, but this type of dukka is not used in Egyptian cuisine hardly ever any more. It is used much more often in other North African countries. Also, olive oil and crusty bread is hardly ever eaten in Egypt nowadays. Egyptian bread is usually flat and soft and olive oil is used to garnish dips but hardly ever a dip for bread itself. I wish I could eat crusty bread with olive oil, your dukka and crusty bread for breakfast, lunch and dinner. But I have never seen or heard of people eating dukka in present day Egypt in this manner. I am sure it happens but not in a widespread or well known. I love Claudia Roden, but on this matter I think she must be a little dated. Just wanted to let you know. I guess it’s been a while since Claudia Roden grew up in Egypt. I was delighted to find your dukka recipe. We first tasted dukka in Australia about 15 years ago and loved it. It’s delicious with a great crusty bread and good olive oil, but now that I have been diagnosed with Celiac disease (there is no really good crusty gluten free bread), I appreciated the suggestions for other uses for dukka!